A&E asked us to help celebrate the massive Original Productions hit STORAGE WARS by creating a two-part insider special. What better way to get inside the heads of these recent auction icons than to have them face off… in our trademark roundtable-chew-the-fat-on-location format… with a Storage Wars twist. What better place to talk treasure than the luckiest place there is? Vegas, baby. We literally cut the chain on the locked doors and shot it in the newly-retired landmark casino, THE SAHARA. 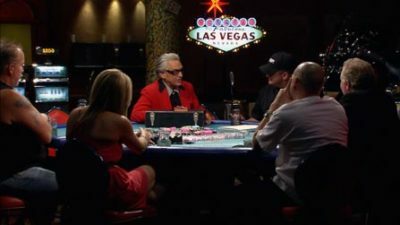 Breakout reality stars Barry, Brandi and the rest of the cast went at it, surrounding a vintage blackjack table, with TV mogul and Storage Wars creator Thom Beers as moderator. We discovered what they love and (mostly) hate about each other, their oddest finds, personal strategies and most lucrative scores. We even threw in some high stakes bidding right there so they’d feel at home. Buy Low, Sell High.